Israel allows a Russian military aircraft to get between its F-16s and Syrian anti-aircraft missiles. However, the downing of the Russian aircraft doesn’t lead to a military confrontation between Israel and Russia. It doesn’t even lead to a diplomatic rift, where the Russian ambassador is recalled for talks. Instead, Russia publicly blames Israel and both sides move on. The fact is that Israel and Russia have a relationship that goes back over a century – a relationship that has shaped Israel to a great degree. Israel is home to a core Russian-Jewish population of 900,000 and a population of 1,200,000 if one includes non-Jewish members of Jewish households. In addition, Russian is the third most widely spoken first language in Israel, after Hebrew and Arabic, and has the third largest number of Russian speakers outside former Soviet countries, and the highest as a proportion of the total population. The first Jewish migration from Russia occurred nearly 150 years ago. These families settled in the Ottoman Empire in the 1880s in order to escape oppression in the Russian Empire and later mostly intermarried with local Jews. Their descendants included famous Israeli military figures and politicians such as Alexander Zaïd, Rafael Eitan, Ariel Sharon and Major-General Alik Ron. Many of the early Jews settled in commune-like kibbutz that followed Communist doctrine. This made Soviet Union/Zionist relations warm when Palestine was part of the British mandate and the early days establishing the state of Israel. In May 1947 Soviet Deputy Foreign Minister Andrei Gromyko told the United Nations that the USSR supported the partition of Palestine into a Jewish and an Arab state. The USSR and its allies voted in November 1947 for the United Nations Partition Plan for Palestine. It paved the way for the creation of the State of Israel. On May 17, 1948, three days after Israel declared its “independence”, the Soviet Union officially recognized Israel. However, relations soured and were severed by the Soviet government in June 1967, in protest of Israeli policy during the Six Day War and immediately after. The Soviet Union only resumed diplomatic relations with Israel on October 18, 1991 – two months before the USSR collapsed. The first modern Jewish migration from Russia occurred while the USSR and Israel didn’t have diplomatic relations and was political in nature. Political dissidents like Natan Sharansky were part of this group. They were strongly anti-communist, pro-West, and political. This was the first time that Russian Jews had a strong voice in Israeli politics. In 1995, Sharansky and Yoel Edelstein founded the Yisrael BaAliyah party, which promoted the absorption of the Soviet Jews into Israeli society. The party won seven Knesset seats in 1996. It won 6 seats in the Israeli legislative election in 1999, gaining two ministerial posts, but left the government on 11 July 2000 in response to suggestions that Prime Minister Ehud Barak's negotiations with the Palestinians would result in a division of Jerusalem. After Ariel Sharon won a special election for Prime Minister in 2001, the party joined his new government, and was again given two ministerial posts. It has since merged into the Likud Party. The second major migration from Russia to Israel was during and after the collapse of the Soviet Union. Unlike the previous migration, this one was economic in character, not political. Sensing that many of theses Russian immigrants would be likely Likud supporters, Israel’s Likud government opened its doors wide to Russian immigration. As a result, the majority of Russian Jews live in Israel, not Russia. And, the Russian Jewish population represents about 20% of Israel’s population. Another political advantage of the migration for the Likud Party was that it reduced the political impact of Palestinian living under Israeli authority (referred to as Arabs of 1948). This Russian migration had a major societal impact on Israel. Most of the Russian Jews were educated and the number of Jewish professionals like doctors and engineers grew in the 1990s. There were also many who drifted into politics. One example is Israeli Defense Minister Avigdor Lieberman. He is a Soviet-born Israeli politician who serves as the Defense Minister of Israel. He served as Israel's Minister of Foreign Affairs from 2009 to 2012, and again from 2013 to 2015. He has also served as member of the Knesset and as Deputy Prime Minister of Israel. Although Lieberman advocates Israeli membership in NATO, he has close relations with Russia. After the 2011 Duma election, in which Russian President Vladimir Putin's party United Russia won, Lieberman was the first international politician to describe them as "absolutely fair, free and democratic". Putin has described Lieberman's own political career as "brilliant". Lieberman's pro-Russian stance and perceived friendly relations with Putin have also drawn criticism from fellow Israelis. Controversy also emerged when it was revealed that a chairman of Lieberman's party, Leon Litinetski, was also employed by the Russian government, as a chairman of the Coordinating Council of Russian Compatriots, a position appointed by the Kremlin. Israeli/Russian Jews with dual citizenship have also helped Putin politically. Hundreds of thousands of Russian-Israeli citizens live in Israel. During Russian elections, the Russian government set up polling stations across many Israeli cities as well as smaller towns, in order to enable the Russian citizens who are living in Israel to cast their vote. In the 2018 Russian Presidential Election, Vladimir Putin was the most popular candidate amongst Russian Israeli voters, winning 72.62% of the vote. 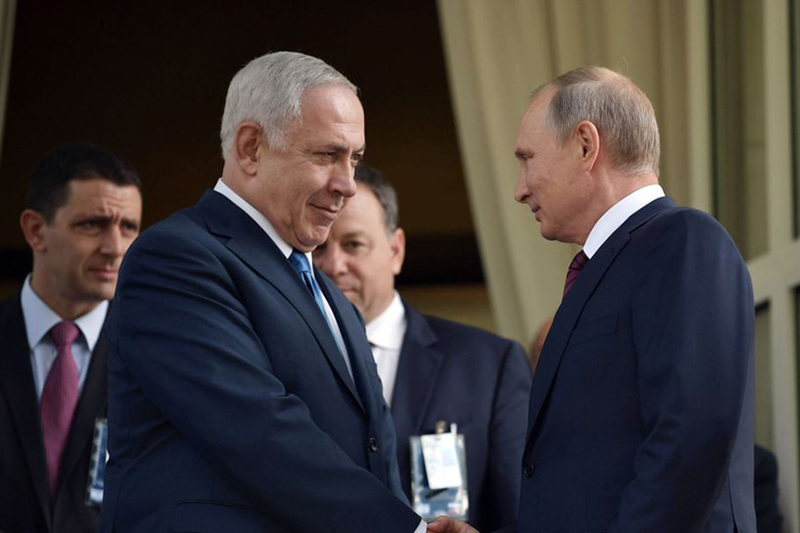 There is no doubt that this close relationship between the Israel and the Russian President helped smooth over the shooting down of the Russian Il-20. Although many Israelis were born in the Russia, speak Russian, eat at Russian restaurants, and read Russian language Israeli newspapers, that don’t mean they agree with Russian foreign policy. The widely differing policies of Russia and Israel in Syria prove that. A similar analogy is found in the US. Many Americans are of Northern European/Germanic extraction. However, that doesn’t stop them from agreeing with President Trump when he disagrees with German Chancellor Merkel on policy. In looking at the recent Russian migration to Israel, there are three differing groups with differing political views and global outlook. The first is the group of Jews who migrated from the Soviet Union. Although older now, they are very anti-communist, religiously Jewish conservative, and usually vote Likud. They take a harder line, especially since the USSR was anti-Israel and pro-Arab during the Cold War. It is also worthy to note that many are less likely to be involved in public political activity. They are also more likely to be religiously observant Jews. The post Cold War migration is less political. These Jews migrated for economic reasons. They are usually educated and came to the Israel for a better life. They aren’t observant Jews and in many cases are Christian. Ironically, about one in five of them have left Israel over the last quarter century for nations like the US. The final group consists of those whose parents migrated to Israel when they were too young or were born in Israel to Russian parents. Although their cultural background is Russian, they have very different views of Israel and Russia. They are neither traditional Zionist Jews nor Russian Jews. Another difference is that many of these immigrants have problems with the religious policies of the Likud government and Prime Minister Netanyahu. While the older Russian Israelis may stay away from politics due to the limited political experience, they grew up under in the Soviet Union, the younger Russian Israelis don’t and are willing to protest. Yesh Atid is a centrist political party founded by Yair Lapid in 2012 that seeks to represent what it considers the center of Israeli society: the secular middle class. It is currently rivaling Likud as the biggest party in opinion polls. These two young, Jewish ladies aren’t unusual. Traditionally, migrants who integrate into their new country’s culture lose their close ties to the “homeland.” Within a couple of generations, they aren’t much different than those who have lived in that country for generations. Israel is experiencing this. As the generation that participate in the establishment of Israel dies off, Israelis view their country and the neighboring nations differently. Yesh Atid is pushing for negotiations with the Palestinians, the end of the current draft law that is the basis for the large Israeli military, halting construction of Israeli settlements in occupied territory and the end of corruption in government. Today’s Israeli is more interested in economic opportunity and a good life than following a strict Jewish system of laws. That is something that Likud has been slow to understand. That means the Russian immigration they advocated a quarter century ago is very likely to be a factor in future electoral defeats. The reality is that the Russian migration didn’t help the Likud as they hoped. It hasn’t made Israel adhere to Russian foreign policy. Nor has it created a majority that wants to remain waging war of aggression against its neighbors.